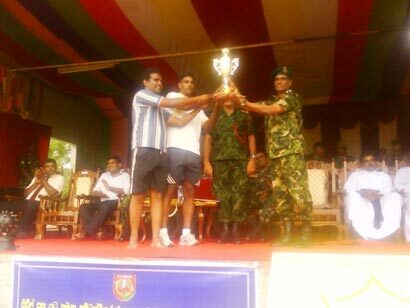 Annual inter club sports tournament organized by the Sri Lanka Army Civil Affairs Office of the 513 Brigade at Uduvil, Jaffna concluded recently with the finals of the tournament and presenting of awards and certificates to the winners at Sellamuththu ground, Manipay. This is the third consecutive year that the Sri Lanka Army organised the event for Jaffna youths after elimination of terrorism. 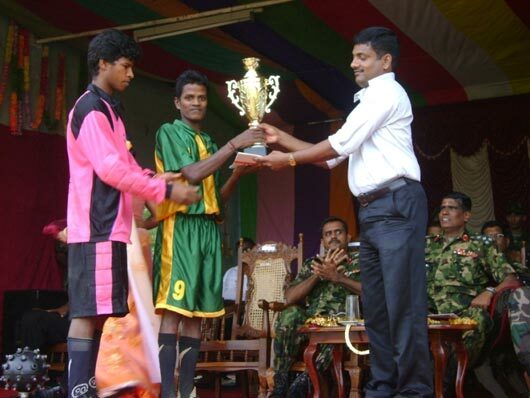 Initially the Sri Lankan Army provided sports equipments for Jaffna youths to form sports clubs in the aim of developing sports and talents in the area few years back. During the dark era they were denied from any sports tournaments in Jaffna and could not enjoy the freedom. However this year it was a huge success that all together seventy eight sports clubs representing Jaffna youths participated the competition in football, cricket and volleyball. Forty three cricket teams, twenty football teams and fifteen volleyball teams took part in the preliminary rounds of the tournament and two teams from each game were selected for the finals. Mahathma Sports Club-B of Anaicoddai won the CIMIC-Munchee Volleyball Cup while their A team became the runners up. Anna Sports Club of Araly won the CIMIC-Munchee Football Cup by defeating Kalaimagal Sports Club of Alaveddy at the finals. Meanwhile, Sri Murugan Sports Club of Mallakam became the CIMIC-Munchee Cricket champions trouncing AB Sports Club of Inuvil in the finals. L. Anithan of Mahathma SC-B Team, N. Hariharan of Anna SC and S. Puhitharaj of Sri Murugan SC were awarded as the best players’ trophies respectively in volleyball, football and cricket. At the same time, six teams, two from each game that qualified for the second round were also presented sports items and certificates. Ceylon Biscuits Ltd. (Munchee) sponsored the tournament and provided all gifts given to winners. Rev. Maheshwaran Kurukkal of Suthumalai Muththumari Amman Kovil, Rev. Fr. I. Rajkumar of Uduvil Catholic Church, Rev. Fr. S. Anthony of Kokuvil Catholic Church, General Officer Commanding 51 Division Brig. Piyal Wickramarathne, Thelippalai Divisional Secretary Mr. S. Muralitharan, Santhilippay Divisional Secretary Mrs. S. Yoganayagam, Munchee Marketing Supervisor for the Northern Province Mr. S. Thayalan and a large crowd of civilians participated in the event. After the prize giving ceremony, a grand musical fiesta was organized by the 513 Brigade at the same venue in the evening. Music group of the 9th Battalion of Sri Lanka Sinha Regiment (9 SLSR) played at the evening show and Army soldiers, girls and boys in the area showed their talents of singing and dancing. 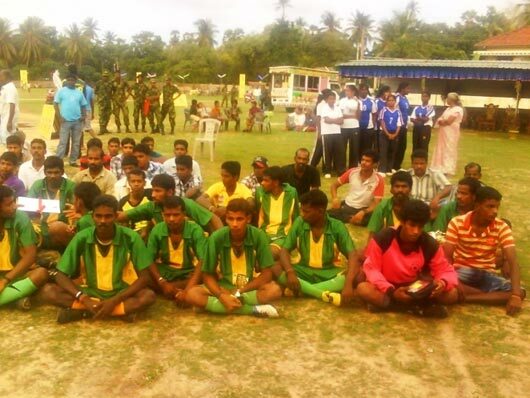 Jaffna youths commented and expressed their sincere gratitude towards the Government of Sri Lanka and the Army for providing them all the facilities and opportunity to compete among themselves in sports. They also said that they are willing to participate island wide competitions in the near future to develop their skills and talents which they were deprived by evil motives of tiny minority for their personal gains for three decades.